Update: Team registration now fully runs via PB Results. Go to https://www.pbresultsonline.com/event/486/info to register for the upcoming or other events. 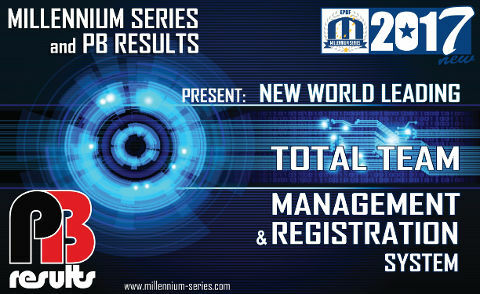 The Millennium Series has partnered with the PB Results tournament series in order to modernize servicing for the teams and their members. We have created a short material that will explain how to navigate through the new system. Each registered team member has received and e-mail for their new profile in the pbresultsonline.com website. This will ensure their registration in the Millennium Series tournaments. Log in using the authorization data you have received and go the MY PROFILE section. After the log in, make sure that all the data is correct and that you have filled out all the necessary information and saved it. Then you can access the MY TEAMS section. Here you can find the team or the list of teams where you are registered as a member. Choosing a team, you have access to the team’s information and its participants. Here you also have the option to leave the team. Please make sure that you are added to the team. Moving the section Events and results you will have access to the game list and information about the team’s roster. This could be changed by the manager of the team. Please make sure that you are included in the team’s roster that you plan on participating with in the Millennium Series tournaments. All the changes in the team’s roster need to me accepted by the team’s manager. This section also gives the opportunity to create a new team and become the team manager. If you haven`t been added to your desired team, you can sent a request to be on this team. This request will be accepted or denied by the team’s manager. The team’s manager can also find new players and sent requests to join the team. The request can be found under the MYTEAMS section. You can accept or deny this request. In this section you can see your tournament history and new tournaments where your manager has included you as part of the team. The tournament history gives you information about the results of the games as well as the gameplay and scores. You can also see your recent activity and download your ID e-passes, if the option is available. The newest feature in the Millennium series tournaments are the electronic ID e-passes and the electronic check in systems. If you are registered team roster then you have the option to receive your ID e-pass in an electronic format as a PDF file. You can download your ID e-pass and just check in! 1. After the log in, make sure that all the data is correct and that you have filled out all the necessary information and saved it. 2. Please make sure that you are included in the team’s roster that you plan on participating with in the Millennium Series tournaments. 3. Download your ID and go to tournament check in at organ tent! An annual Player or Pit ID e-pass is valid for all 4 events of the 2017 season. NB - the discounted rate applies as long as you complete each player ID profile and the e-pass before you complete the team`s registration in the organization tent. The extra charge only applies if you ask our staff to complete the players profiles for you.